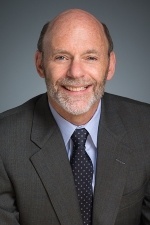 Guy Field has over thirty years of experience as a finance professional in the Portland Metro area. He has worked both as a consultant and a full time finance executive leading accounting and finance teams with startups, emerging growth, and mid-market enterprises encompassing all financial and administrative functions including raising capital, management finance, board of director and investor relations, accounting, legal, treasury, tax management, facilities, and human resources. 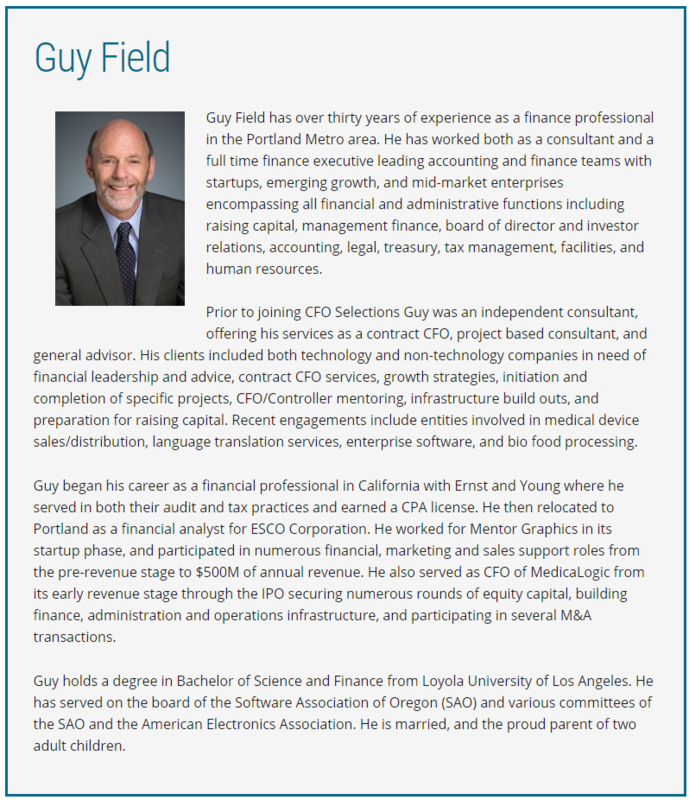 Prior to joining CFO Selections Guy was an independent consultant, offering his services as a contract CFO, project based consultant, and general advisor. His clients included both technology and non-technology companies in need of financial leadership and advice, contract CFO services, growth strategies, initiation and completion of specific projects, CFO/Controller mentoring, infrastructure build outs, and preparation for raising capital. Recent engagements include entities involved in medical device sales/distribution, language translation services, enterprise software, and bio food processing. Guy began his career as a financial professional in California with Ernst and Young where he served in both their audit and tax practices and earned a CPA license. He then relocated to Portland as a financial analyst for ESCO Corporation. He worked for Mentor Graphics in its startup phase, and participated in numerous financial, marketing and sales support roles from the pre-revenue stage to $500M of annual revenue. He also served as CFO of MedicaLogic from its early revenue stage through the IPO securing numerous rounds of equity capital, building finance, administration and operations infrastructure, and participating in several M&A transactions. Guy holds a degree in Bachelor of Science and Finance from Loyola University of Los Angeles. He has served on the board of the Software Association of Oregon (SAO) and various committees of the SAO and the American Electronics Association. He is married, and the proud parent of two adult children.